I really really love this one. It turned out even better than I thought it would, I think its all the polka dots that won me over. I used a solid cream sheet for the back, and I’m not sure what the binding fabric is called, but its a pretty muted red that isn’t too bright. I did simple quilting, just straight stitching 1/4” from the seams to frame in the triangles. It was hard to smoosh the quilt under my machine doing those angled seams, and I certainly got a workout. Which is good since I’ve been sitting on my bum for two days. I think your quilts are so beautiful. I am constantly amazed at how fast you turn out a quilt. I do have a question… your binding looks so much smaller than mine, so I was wondering how wide to you cut your strips? What a beautiful quilt! 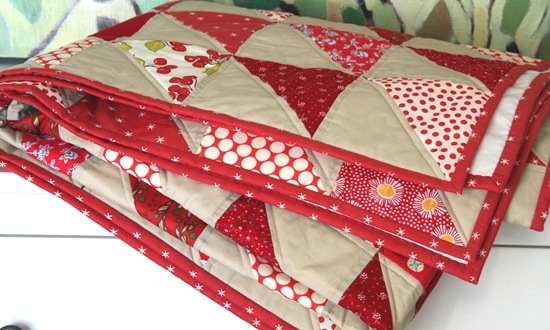 I think everyone needs a good red quilt in the house somewhere! beautiful!!! before i saw your pics i'm thinking to make one! Gorgeous! How many different reds did you use? Oh Wow! That is just absolutely PHENOMINAL! Love it, love it, love it! It's such a gorgeous quilt! Bravo! Btw my husband's been fired from quilt holding too for the exact same reason. I use hangers and the door now… they don't tend to talk back! Beautiful! I love the tan linen. Looks beautiful! I love that, while you might not instantly jump to tan as the solid to put with red prints, it works so wonderfully and gives it such a nice, muted feeling. I really love this. I'm not that keen on red usually, but you really worked it well! And the polka-dots get me too! I love it! It is gorgeous! And I love the painting in the background — who is that by? Thanks for your nice blog comments, I really appreciate them! I've been admiring your blog for a long time, you're a big inspiration for me. I absolutely love all of your quilts!! I really love this one, I've been thinking of doing a plain red and white quilt sometime soon. Another fave is the orange and white. I love the 9-patch you're working on too! Ok, so I just checked the Ikea website and I don't see that cabinet either and now I'm totally having a heart attack b/c I was planning to buy it when we moved. I may just have to run down to the store and see if they have any there because I REALLY wanted it! They've also changed the bedroom furniture I wanted and now I don't like the new color. UGH! I guess I just need to learn that if I really want something, I'd better just buy it when it's there. Have a great day and I will definitely be checking back often and I'd love to have you read my blog too! Really beautiful quilt! I love the simplicity of it, yet the fun diverse red prints keep it lively. Great work! Love this quilt! Love your blog too! Keep up the great work! 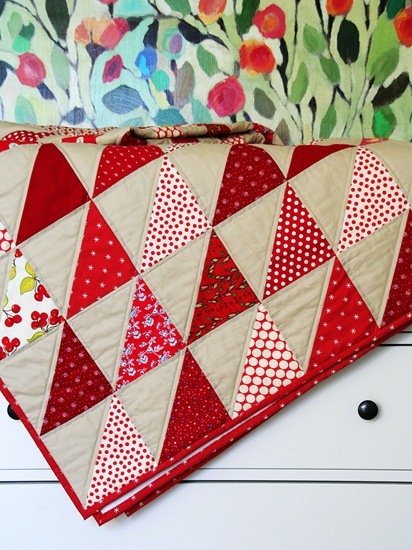 I love red quilts and yours is gorgeous! Oh Allison I just LOVE this one. Simple is sometimes better! :) You inspire me to no end!! Thanks for posting this one! Wow, it seems like you just started it! You are quick! Its DARLING, I love red. I can't imagine you barking orders!! :) We need to meet up sometime, have like a girls weekend vacation… Do ever talk to Telly? I can see why you love this one…it is stunning! Makes me want to pull out all my reds and get one made. So very pretty! Absolutely gorgeous!!! Time to bust out my red fabrics!! I'll join the chorus here , I love that quilt . I really love that quilt ! Just beautiful, I love the colors. I REALLY like this quilt. I especially like how you quilted it. PS The cream sticks are melting today in Holmes Co. The quilt is truly lovely. I admire the triangle quilting. I thought about that for one and realized how much turning I had to do and decided against it. Kudos to you! Oh, Allison! It is wonderful! 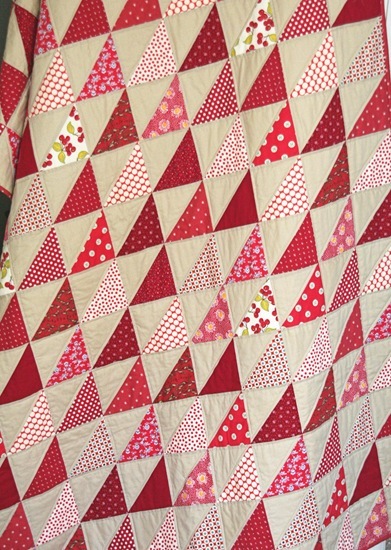 I love two color quilts and I am partial to red. I love the scappiness and the simplicity of the design. Love it! The red and white quilt is terrific! Nice finish. Oh that's a great looking quilt. Wonderful job! The question of the feed taking an hour ~ I am not super knowledgable in feeds yet but, I believe I saw a setting with the defualt setting being an hour. Beautiful! I love vibrant, red quilts! It is great in all red though! Beautiful work. It ended up soooo loverly! Fantastic! What a pretty quilt! I love all the reds – very bright and happy! that is amazing!! so pretty!! i so would love to make one of those!!! I love your red quilt. May I ask what is the name of your red polka dot with white background fabric is called? I think I will put that on my list of things to make next. i'm not usually a fan of lots of red but i really like this!! totally gorgeous…love the background fabric you chose! I absolutely love the quilt! Sorry, I'm so behind in my blog reads! cranky??? I can't imagine, none of us, really! I love this quilt too. It's cheery, fresh, and…………………..polka dotty!!! LOVE it!! This is a beautiful quilt!! Sometimes the simple designs make the biggest impact! !